Our annual search for Spring leads us to a quick jaunt to Columbus Ohio on Easter weekend. 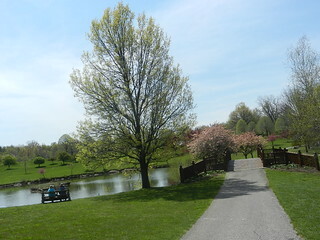 In just over 3 hours we can be looking at Daffodils, Tulips, Magnolias and flowering Pear trees. 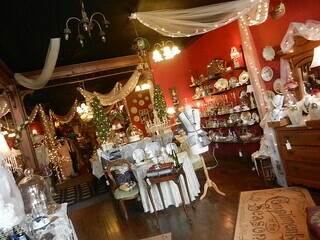 We can stroll the streets of German Village, maybe have a coffee while sitting at a cafe table or park bench. Then again, you never know what Mother Nature has in store. 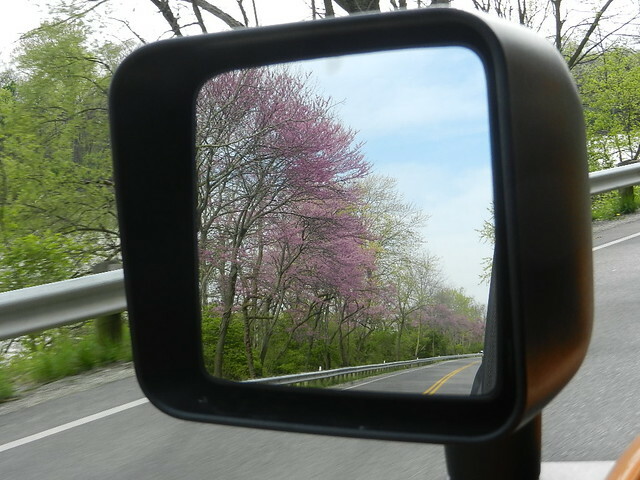 We’re taking our usual, scenic, route 257 along the shores of the Scioto river. Arriving in Dublin we make a quick stop at Hayden Falls before lunch. We park in the small lot on the side of Hayden Run Rd. 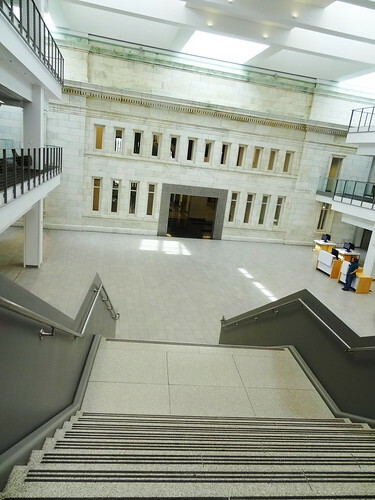 A stairway leads us down to the river, the current moves rapidly, the 35′ waterfall stands at the end of a boardwalk straddling the Scioto River. 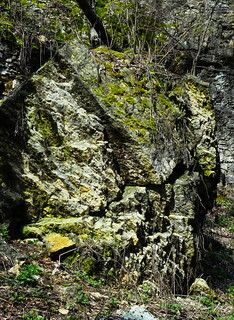 The trees surrounding the river are still bare, bright green moss clings to the limestone. The closer we get to the falls the thicker the mist, the wooden walkway is wet, the sound of the waterfall roars in the wind. Kris puts up his hood and stands at the end of the boardwalk, water rushes over the cliff’s edge, crashing into the river below. 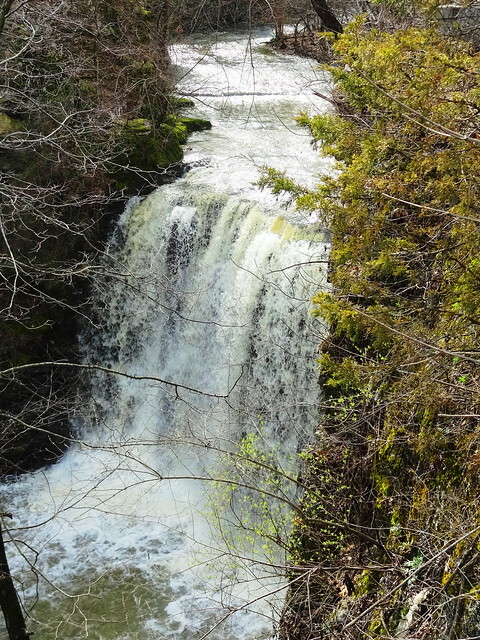 The river has swelled from all of the rain, making the waterfall even more dramatic. The boardwalk is popular; we encounter those out for daily exercise, visitors taking photos and locals just hanging out. Dublin has a quaint, historic downtown filled with independent shops, restaurants and boutiques. We park on N High Street and walk a little while we decide where to have lunch. I love the stone walls and old architecture, look, Daffodils are blooming. 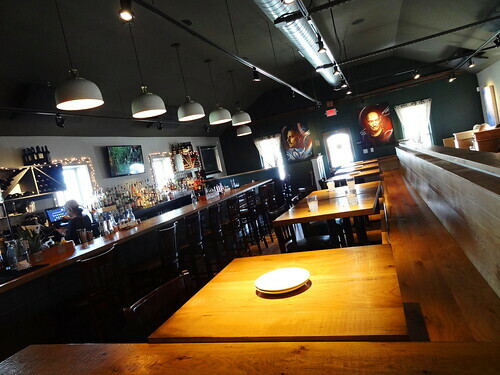 Harvest Pizzeria comes highly recommended so we’re giving it a try. The lunch rush is over so we practically have the place to ourselves. A friendly waitress gets us our drinks and tells us about the daily specials. 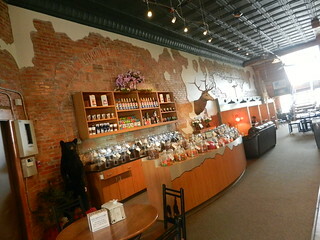 Harvest is regional to Ohio, they source their ingredients from local farms and businesses. 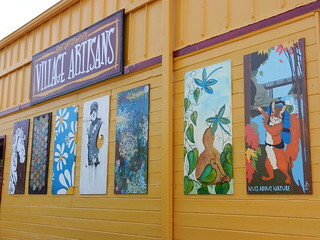 The place is attractive; lots of wood, strong colors and bright artwork. We’re having the pizza and salad special. We choose the Mean Green Salad; spinach, arugula, watercress, red and napa cabbage, snow peas, sprout blend, toasted pepitas, pickled blueberries with an avocado goddess dressing, it’s super flavorful and fresh. 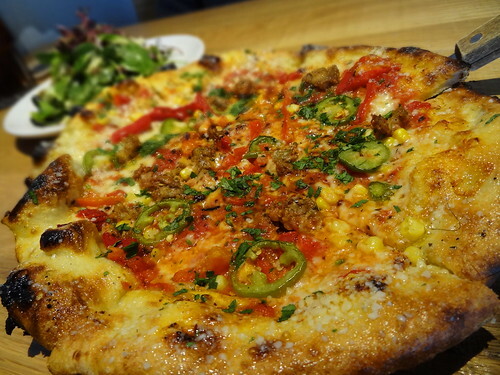 The Spicy Yuma Pizza has a blend of 4 cheeses, chipotle-spiked tomato sauce, roasted red peppers, chorizo, jalapeno, corn and cilantro; look how pretty it is. It tastes delicious; spicy but not overdone, I love the crust, thin, crispy and chewy at the same time, good choice! We follow the Scioto River all the way from Dublin to Columbus, it’s a lovely drive. We park on Broad St, the river on one side, the LeVeque Tower on the other. Last time we were here the building was undergoing renovations, we’re anxious to see how it looks. 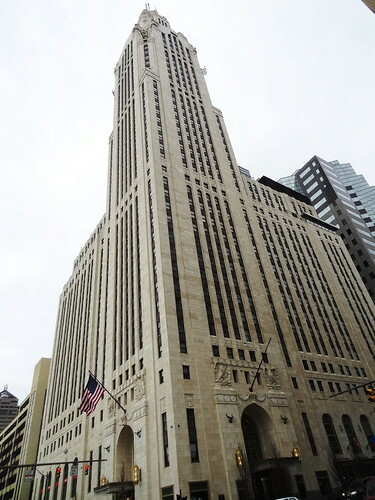 A little building history: Originally named the American Insurance Union Citadel the 47-story skyscraper was completed in 1927; it was the tallest building in the city until 1974, today it is the second tallest. 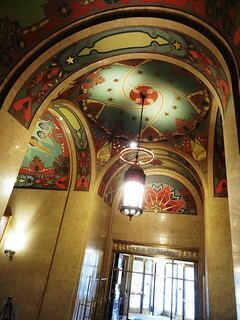 You may recognize the name of the architect, Detroit’s own C. Howard Crane, think the Fox, Fillmore, Detroit Opera House, Orchestra Hall… LeVeque Tower was his tallest building. The cream-colored terracotta is decorated with figures along the facade and pinnacle, it has an octagonal bartizan at the top, making it the most recognized building in the city. It was designed with 600 hotel rooms in 2 wings and is attached to the Palace Theatre. The name has changed several times through the years, in 1977 it became the LeVeque Tower. 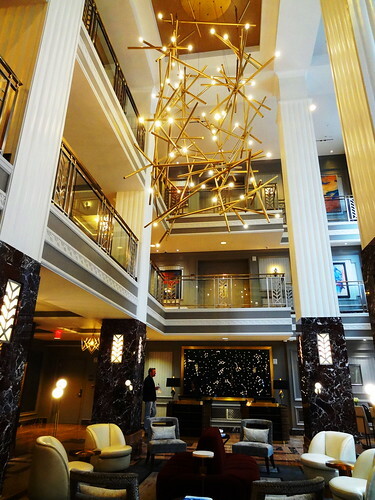 The most recent renovation was completed in 2017, it’s currently a mixed use development of apartments, condos, offices, a restaurant and a Marriott Autograph Collection 150-room hotel. 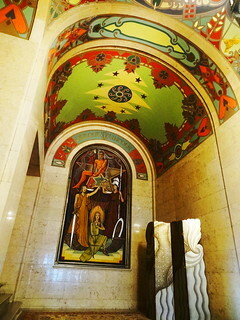 We enter the Art Deco structure through the revolving door, we are greeted by hand-painted Byzantine-style designs on the ceiling and walls. As we move further inside the hallway opens up into a lounge area. 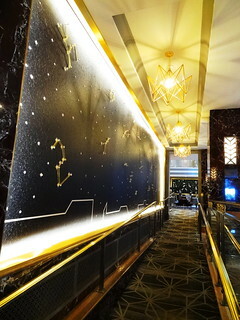 The original building features are combined with a celestial-inspired theme; I really like the funky light fixtures. Making our way to the second floor we have an open view of the lobby area, it’s gorgeous. Cream-colored columns are grounded in black and burgundy marble, there are touches of gold throughout the decor. 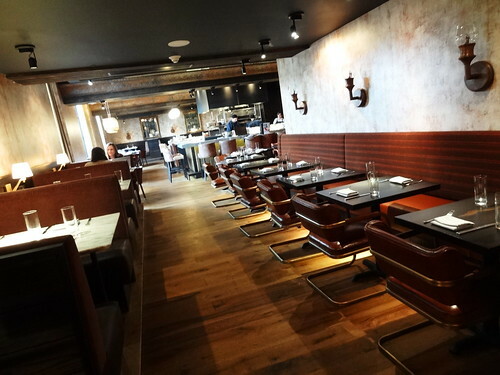 To one side is The Keep, a modern French Brasserie-styled restaurant and bar. Rat Pack style music plays in the background, low light, brown leather chairs and rustic sconces give the dining area a clubby, masculine feel. The restaurant opened about a year ago to rave reviews, it was voted one of Columbus’s Top New Restaurants of 2017. Next time we’re in town we’ll have to stop back in. 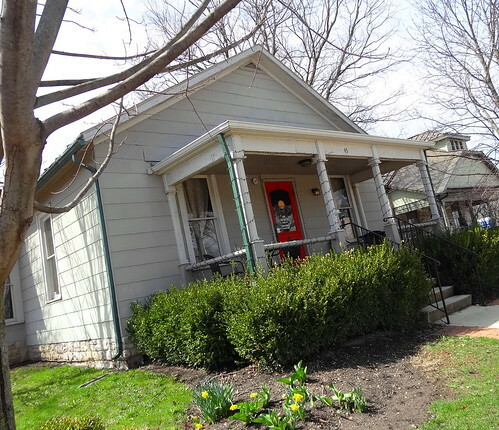 The Columbus Metropolitan Library has been in this exact spot on Grant Ave since 1907. 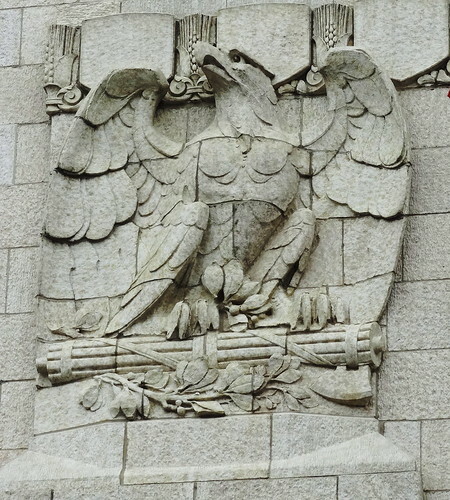 The building was constructed with money donated by Andrew Carnegie. 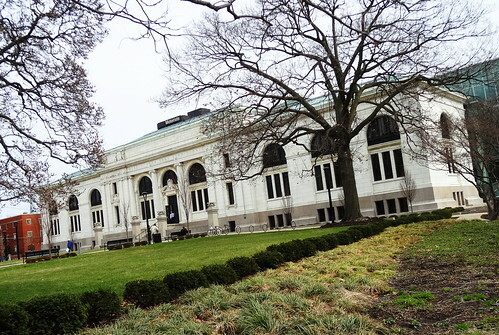 In Ohio alone 104 libraries were built from 79 grants awarded by the Carnegie Corporation of New York from 1899-1915; that’s amazing! 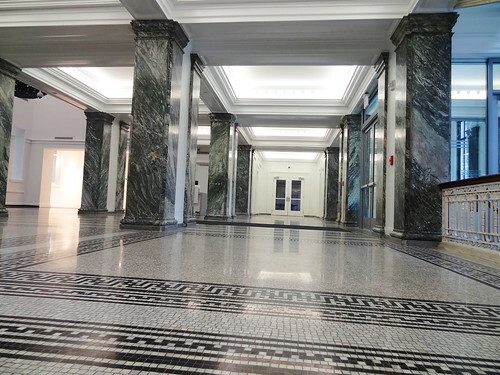 The Italian Renaissance building faces a newly renovated plaza, the fountain anxiously awaits warmer temperatures. 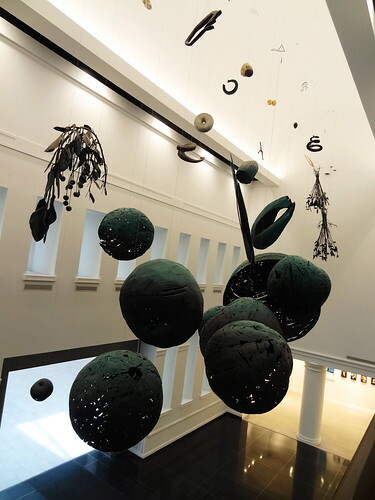 It’s bright inside, among all of the white my eyes are drawn to a series of spheres hanging from the ceiling. Standing still for a moment I am able to take in the space. 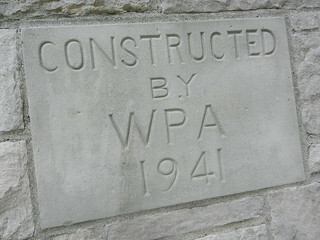 Though there has been much modernization, most of the original architecture remains. 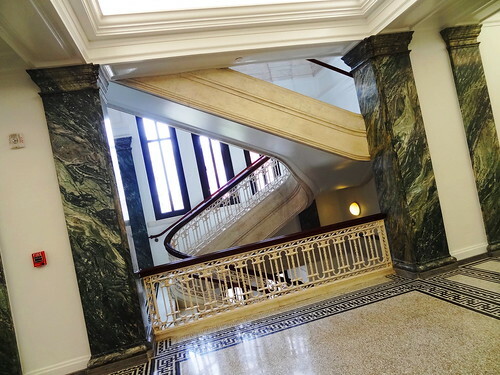 The sloping, sweeping staircases are wonderful; metal balusters topped with wooden handrails. 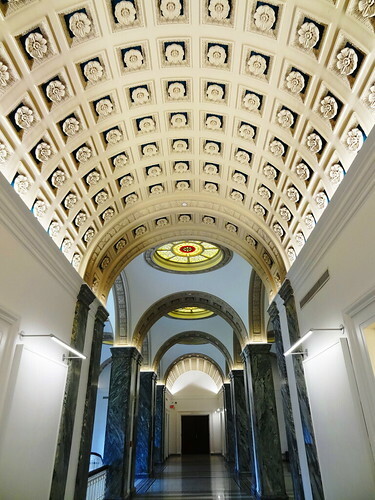 Light pours in through tall rectangular windows, wide-veined green marble, thick moldings and a spectacular floor. 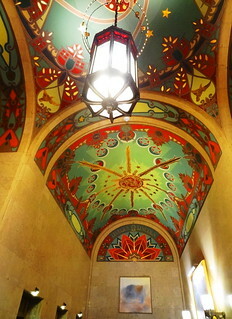 Long halls have barrel-vaulted ceilings, white rosettes cling to a teal-colored background. 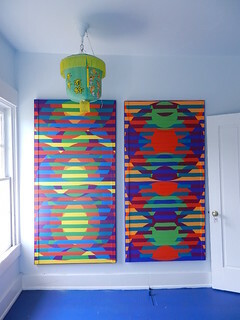 A series of colorful stained-glass skylights allow more light to seep in. 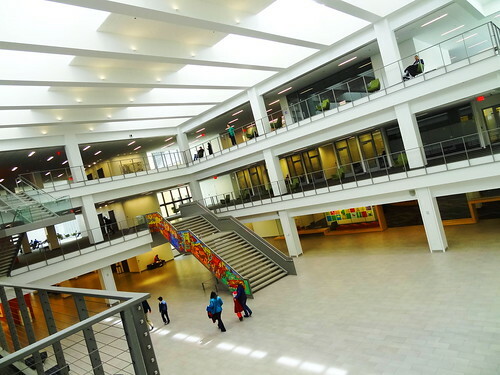 We come to the huge addition put on in 1991, a vast open space bringing the square footage to 255,400. From the main floor we can see the corridors that surround the second and third level; I love that they left the back wall of the original building. It’s all very open and light, lots of glass and metal. 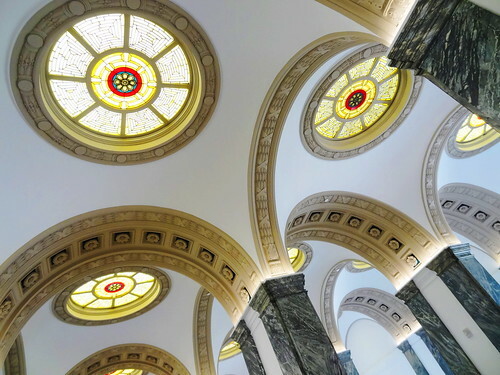 The 2016 renovation opened up the interior by adding windows that run the height from the second to third floor giving visitors a sweeping view of the adjacent Topiary Park. 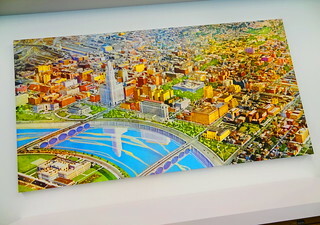 A multi-hued canvas print depicts Columbus back when rail yards and train tracks criss-crossed the city, the LeVeque Tower stands prominently, its image reflected in the Scioto River. We make frequent stops at the windows, looking out on the city skyline. A lot has changed since that print was made, but the capital city still remains a vibrant, beautiful, active place to live, work and play. 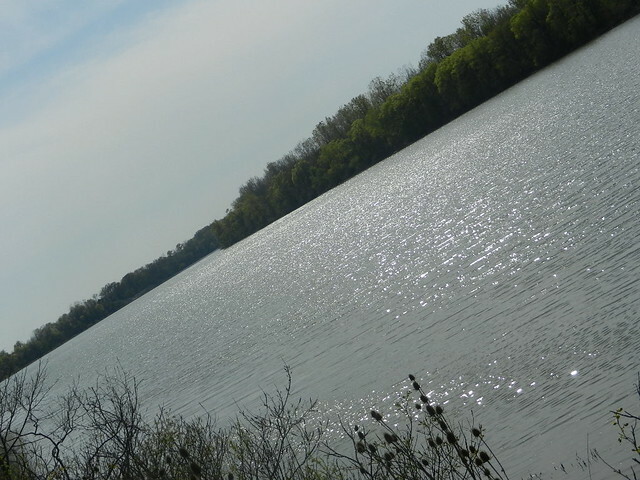 Today I will finish up our spring tour of Ohio with a trip along the Maumee River. We begin our journey by hopping on I-75 south to Toledo. 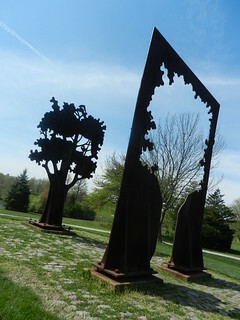 On the west side of the city is the Toledo Botanical Garden. 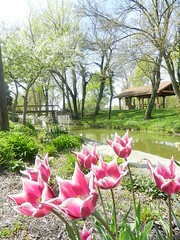 This is a lovely place to walk around; free to the public year round it consists of 60 acres of display gardens, sculpture and Crosby Lake. We come in through the Elmer Drive entrance; the Tulips were Stunning! Tall yellow and purple Tulips create a border the length of the garden wall. 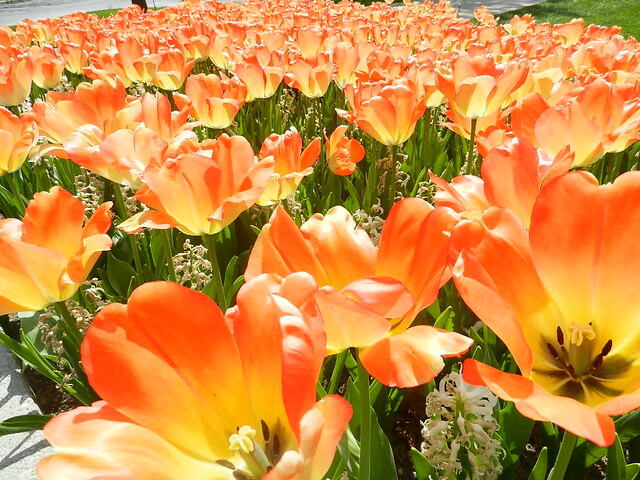 Once inside we got ourselves parked and were drawn to another Tulip bed; these were a magnificent orange. We began exploring the grounds in the shade garden; Azaleas were in full bloom showing off blossoms of hot pink in contrast to the white Dogwoods. Daffodils had come and gone but replacing them were Anemone, hostas and Forget-me-nots. This area is lush, you can have a seat at the nearby gazebos and relax while watching the fish swim in the pond beside it. Traversing the grass we joined up with the paved path passing several large pieces of sculpture provided by Toledo’s Art In Public Places program. We crossed over the water on the wooden bridge to gently rolling grassy hills dotted with fragrant Crabapple trees. The informal gardens are divided by a stone wall; the flowers here were just beginning to come up, the pergola already covered in Wisteria vine in bloom…. much to the delight of the local bees. We meandered around the grounds encountering a herb garden that smelled fantastic, and several other Tulip displays. Each time we come it looks completely different, but it is always a place of beauty and tranquility. Back in the car we make our way to River Rd, as we pass the zoo we have to remember to veer left at the Harvard Circle Cloud Fountain to continue on the scenic byway. 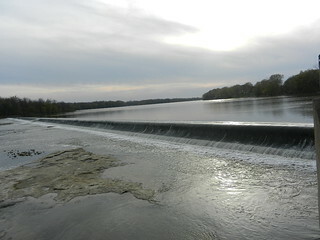 The river flows from the Maumee Bay of Lake Erie through northwest Ohio into northeast Indiana. This section of the drive, through the city of Maumee is picturesque; stately homes sit back from the road, large front yards lend themselves to exceptionally well-tended landscapes. It has a very Grosse Pointe feel to it and all the while the river is in view. The unique thing about taking this trip in the spring is that Walleye come here to spawn from the west end of Lake Erie, the Detroit River and Lake St Clair. As a matter of fact this is one of the largest migrations of river bound Walleye east of the Mississippi. It starts in early March and continues through the end of April. You are probably saying “so”. What that means is, fishermen come from all around to catch themselves some Walleye, it is quite a spectacle. Instead of using boats men wade out into the river and cast their lines, when I say men, I mean lots and lots of men, on a weekend there may be 1000 fishermen out in the water. It’s a whole to-do complete with waders, fishing caps, coolers and hibachi’s. Not getting any bites? 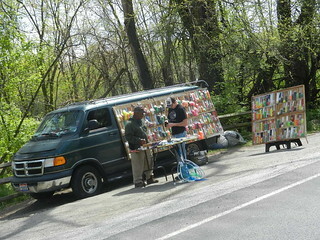 No problem, just stroll on over to the nearest truck selling fishing lures and try something new. In the town of Waterville we cross over to the south side of the river. Here the terrain becomes a little more country in feel; houses are farther apart, and we start to see farms. Our next stop was the charming hamlet of Grand Rapids; main street looks like a picture on a postcard. 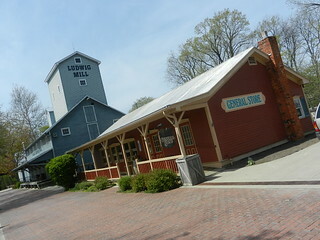 Victorian style brick buildings, tiny shops, restaurants, an ice cream stand, and a wonderful view of the river. We meandered in and out of storefronts; the general store has a fun variety of vintage style candy in large glass jars, along with chocolate and other treats. 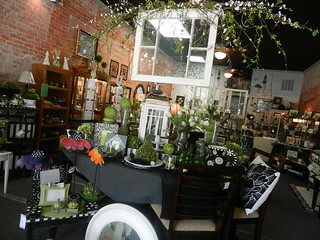 New stores seem to be opening all the time; if you like those girlie home decor shops grab your girlfriends and make a trip down. 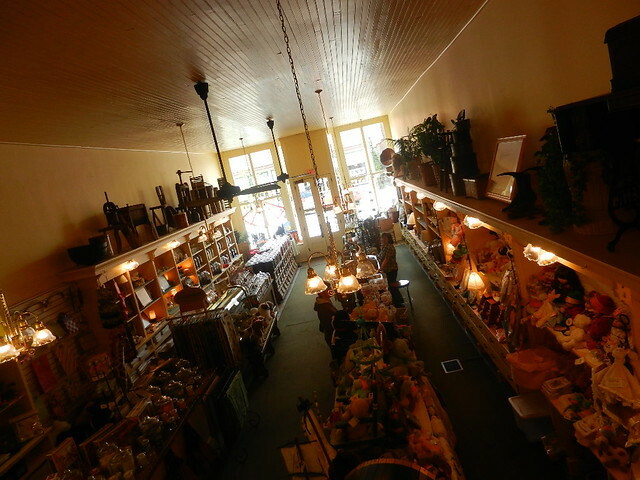 Antiques from furniture to jewelry are in abundance, they even have an old fashioned book store. It was a pretty day so we picked up a few slices of pizza from Pisanello’s and ate at a picnic table overlooking the Maumee. Grand Rapids has done a marvelous job making the town a wonderful place to visit; they even have an original lock from the Miami Erie Canal, it’s fascinating to see. As a matter of fact throughout much of the drive there is evidence remaining from the old canal. Back in the car again, this time heading toward home. 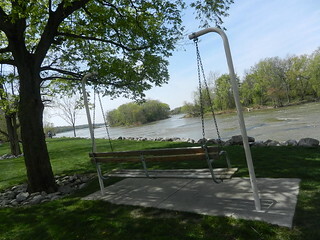 Ohio is known for its wonderful park systems; the Maumee river valley is loaded with wonderful metro parks. Each one we explored had free admission and great views of the river. 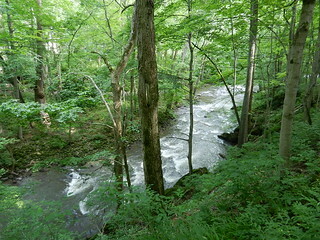 Independence Dam State Park offers a hiking trail that was once the towpath for the Miami/Wabash/Erie Canal, it is three miles long and winds between the old canal and the river. We journeyed back the same way we had come; the fishermen were gone now and towns were coming to life on this mild Friday evening. When we arrived back in Grand Rapids we stopped for an ice cream. For the remainder of the way we followed 65 on the south side of the river through Perrysburg and back into Toledo. 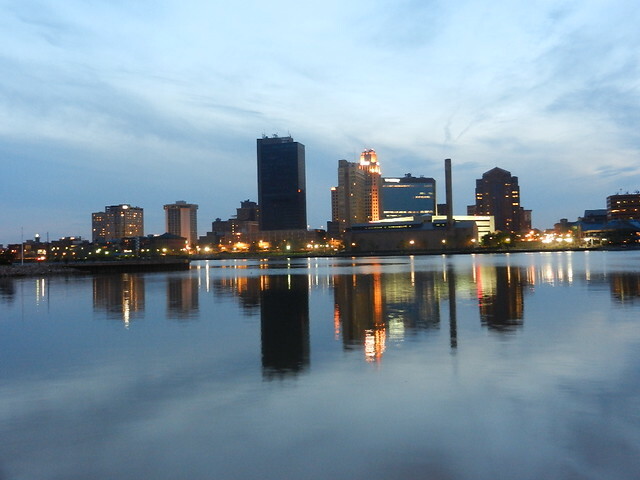 We said farewell to the Maumee while enjoying a picturesque downtown view. We took it all in, glad to have had an amazing day and a wonderful ride. 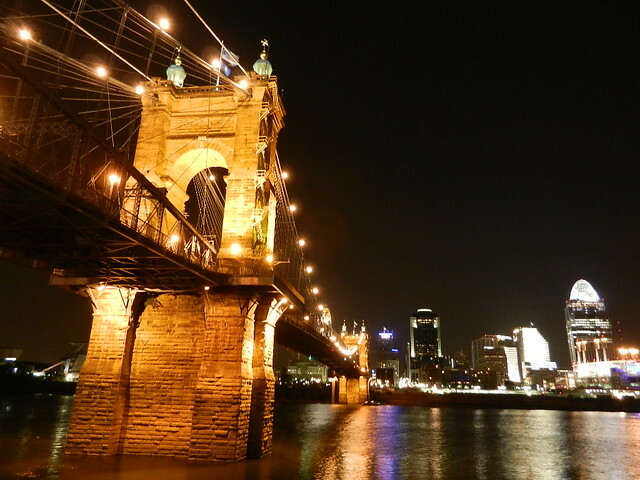 Our weekend destination was Cincinnati Ohio with a few stops along the way. We took I- 75 into Toledo, then followed the Scenic Maumee River to 235 South. Kris has a knack for taking the route less traveled from place to place, to him the ride should be as enjoyable as the destination. 235 is easy traveling, not a lot of traffic, plenty of curves, and pretty scenery, no cities to pass through here, only tiny hamlets and an abundance of farmland. At Bellefontaine we got on 68 and took it into Springfield Ohio. 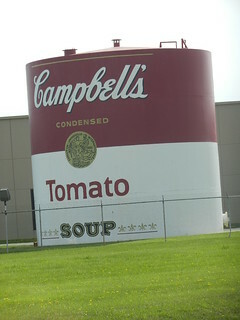 Springfield Ohio is located about mid-state and shares a similar history with Detroit. 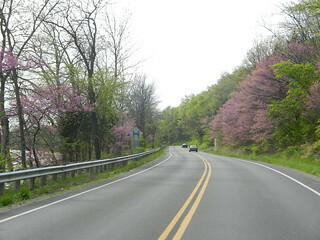 Route 40, a Historic National Road that began in Maryland near the Capitol, ended in Sprinfield for about 10 years before continuing westward. This made it very attractive to industrialists; from 1916 to 1926 10 automobile companies operated here. International Harvester was the leading employer building farm machinery and later trucks. The list of items produced here is staggering. Like many cities it has suffered as manufacturing continued to go overseas. Springfield is definitely a place worth visiting, remnants of the grandeur of days gone buy still remain in magnificent public buildings and grand homes. 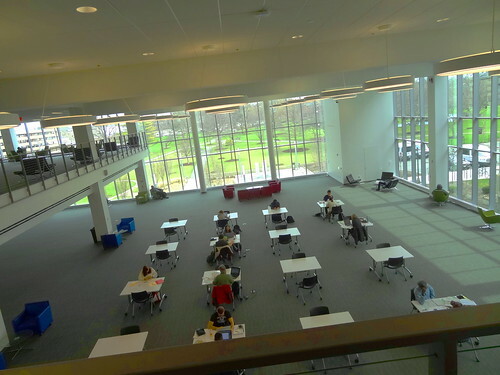 Wittenberg University, one of the most highly rated liberal arts universities in the nation can be found here. Frank Lloyd Wright’s only Prarie style home in the state of Ohio, the Westcott house, resides here as well and is open for tours. 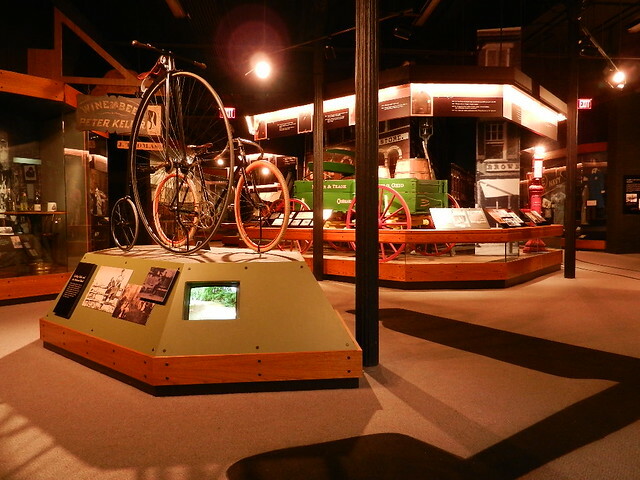 Be sure and visit the Heritage Center of Clark County, the architecture alone is worth the stop! 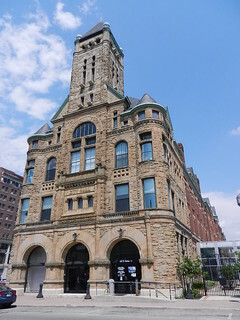 Built in 1890 in the Romanesque style it was the original City Hall and Marketplace, oh what it must have been like to buy carrots and tomatoes in such surroundings! 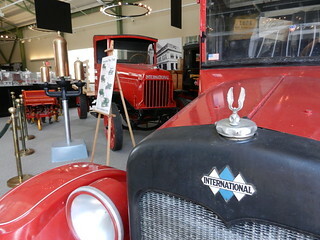 Exhibits were impressive; a 1920 Westcott Motor Car, an old iron cannon, a horse drawn Champion Reaper, and several vintage International vehicles including a lumber truck and a Fire Truck. Signs from many of the local manufacturers hang from the ceiling emphasizing the prestige of this once industrial giant.The museum was much larger and even more interesting that we anticipated. Time to hit the road and find some lunch. Continuing south along 68 ,Yellow Springs, a tiny town of only 1.9 sq miles was our next stop. Founded in 1825 by a group of families looking to create a Utopian community, part of that feeling still lingers, you might even say it has a hippie vibe.This is a haven for the Arts, galleries line the main thoroughfare along with cafes, modest sized shops and a cinema. Color coded trash cans dot the sidewalk urging you to sort and recycle your trash, words like local and organic are found on signs throughout town. Many restaurants offer outdoor seating overlooking Xenia Ave. Current Cuisine is a gourmet Deli we have eaten at many times, and did so again. There is a large selection of ready made food to choose from, everything looks appealing, so it’s hard to choose. A deli sandwich, salad, and an empanada did the trick for us. We took a stroll through town wandering in and out of shops enjoying the colorful mix of people you are bound to encounter while visiting. The Little Miami Bike Trail comes through Yellow Springs making it a welcomed stop for bicyclists. 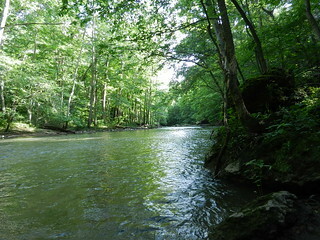 We veered off of 68 and went a short distance east on 343 to Clifton Gorge a state nature preserve. Also a regular stop for us when in this neck of the woods, it is a great way to stretch our legs and get some fresh air and exercise after being in the car for a prolonged time. 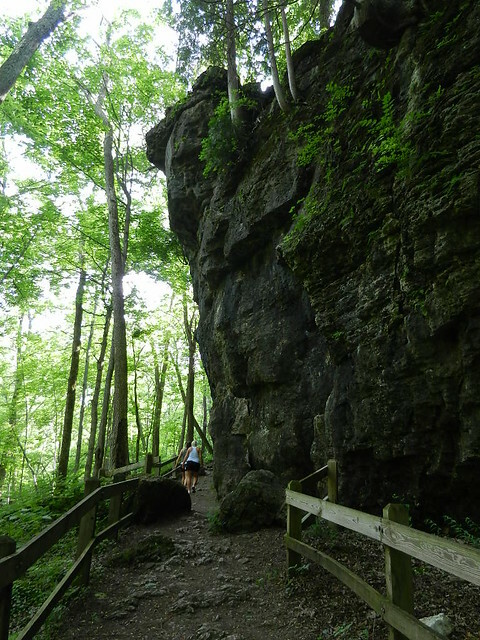 Clifton Gorge is a spectacular example of post-glacial canyon cutting, sounds impressive doesn’t it? It is! 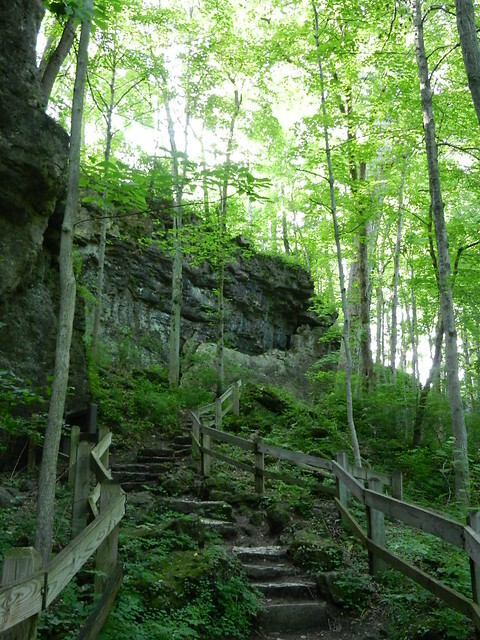 The mile long scenic Gorge trail takes you alongside the Little Miami Scenic River, showing off waterfalls and rapids along the way. Completely surrounded by multiple hues of green of the local flora everywhere you look is a photograph in waiting. Be sure and wear proper footwear as the trail can be slick, you will also traverse some rocky terrain and multiple steps cut into the stone. 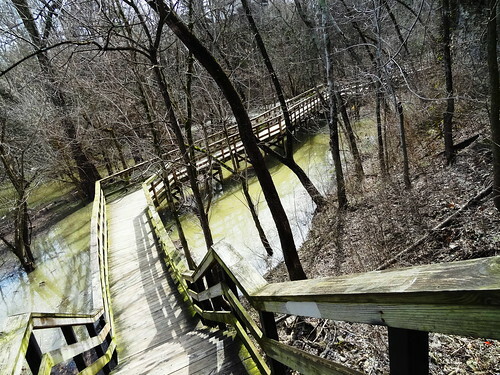 If you have the time and are feeling adventurous cross the footbridge and continue through John Bryan State Park, at the second footbridge cut back over and follow the original Pittsburgh-Cincinnati Stage Coach Route back. 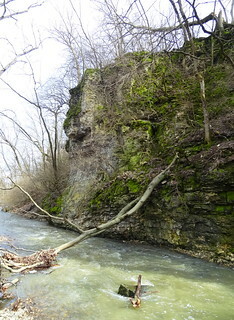 This is a 269 acre preserve that protects one of the most remarkable dolomite and limestone gorges in Ohio. Time had slipped away too quickly as usual, we got into Cincinnati, checked into our room located in the Northside district, then to Covington Ky for a (really) late dinner. We can always depend on Chez Nora for late night food and live music. The evening was warm with a slight breeze that beckoned us to dine on the rooftop. A view of the Cincinnati skyline, city lights shining against the night sky accompanied by good food, good music and good company. Goodnight.